To Cite: Hamouzadeh P, Darkhor S, Aboie P, Zare M, Gray S. Safety and Effectiveness of Superficial Radiation Therapy in the Treatment of Skin Diseases: A Systematic Review, Health Tech Asmnt Act. 2017 ; 1(1):e62068. doi: 10.5812/htaa.62068. Context: Superficial radiation therapy is a low energy radiation therapy that is penetrated only within a short distance under the skin surface, and widely used by dermatologists. This study aimed at investigating the safety and effectiveness of superficial radiation therapy versus other conventional treatments in the treatment of skin diseases. Methods: The following databases were searched systematically from March 31st, 2017: PubMed, and the Cochrane Library. MeSH terms and free-text were used for searching the databases. Additional studies were retrieved from a manual search and reference lists of included studies. Only studies written in English were considered and there was no time limit in the inclusion criteria. The quality of included studies was assessed using the Oxford centre for evidence-based Medicine (OCEBM) levels of evidence criteria. Results: In total, 12 studies were included in this review. In total, 1985 patients were examined. Most of the eligible studies (11 out of 12 with 1795 patients) compared the effectiveness outcomes (efficacy, improvement rate, failure rate, clinical improvement, time of use, recurrence rate, and cosmetic consequences). About half of them (5 out of 12 with 530 patients) compared the safety outcomes (side effects and the severity of symptoms). Conclusions: Based on the available evidence, which was not up to date and generalizable, it could be concluded that superficial radiation therapy had no side effect on the treatment of hand eczema and also had better treatment results and could be used for hand eczema, yet for other indications, further studies need to be performed. The use this technology along with other methods may have better consequences for the patients. In order to make better decisions in this area, new studies must be carried out in various contexts. However, if superficial radiation therapy is licensed to be used in a country, in order to prevent low but serious side effects, there must be a coherent system with the aim of recording its use for each patient. One important field of medical radiation physics is radiotherapy (1). Radiation therapy is the use of high-energy ionizing radiation to control growth or to eliminate rapidly growing cells (such as cancerous tissues). The basis of this treatment method is to damage the DNA of the cell nucleus, which makes it impossible to proliferate and divide the cell (2). The nature of ionizing radiation used in radiation therapy is the same as the radiation used in radiology, and the difference in energy is much higher and the radiation dose rate is higher than the radiation. If radiation is ionized into parts of the body, the DNA of the nucleus of each of the cells exposed to radiation will be affected, with the degree of damage being associated with the amount of DNA activity at that time. In other words, more active and progressive cells (such as cancer cells) are more likely to be injured (3) Although radiation, in addition to cancer cells, affects healthy cells, most healthy cells regain their recovery. The goal of radiation therapy is to eliminate the maximum number of cancer cells with minimal damage to healthy tissues (1). The effects of ionizing radiation in the treatment of other conditions beyond the control of cell proliferation (e.g. keloid or hyperplasia, etc.) can also be used (4). In the light of technological advances, there is a current resurgence in the use of radiation therapy, especially superficial radiation therapy (5). Superficial radiation therapy uses low energy ionization rays in the spectrum of 50 to 150 kVp, and is widely used by dermatologists (6, 7). This type of radiation therapy is used for the treatment of benign or malignant skin lesions over or near the skin surface (3 mm to the skin surface). Hence, it has been introduced as an ideal method for the treatment of superficial lesions, such as basal and squamous cell carcinoma, keloid scars, mycosis fungoides, psoriasis, benign plaques, and other dermatological conditions (8). Superficial radiation therapy can also be used in the following diseases: benign dermatoses, warts, eczema, palmoplantar pustulosis, non-melanoma skin cancer, and basal cell carcinoma (9-20). Some features of superficial radiation therapy, such as delivering low energy kilo-voltage photons and the advent of more portable machines to employ in an office-based setting (6, 21) can make this device popular among physicians. In addition, there are significant differences in the depth of tissue penetration between high-energy devices and surfaces. High-energy devices used in radioactive cancers target internal malignancies and spare the cutaneous structures. In contrast, superficial machines spare the deeper structures and target the skin, a quality that is ideal for the irradiation and the treatment of cutaneous malignancies (22). Numerous studies have been done on the many applications of this technology, and comparing it with other similar methods (Grenz ray, placebo, surgery, photochemotherapy, electron beam therapy, and brachytherapy) (11-20). The compilation of these studies can help ensure the safe use of this technology. In addition, superficial radiation therapy dose is based on both the size of the tumor and the age of the patient, and radio physicians play a decisive role in determining these doses (6). During treatment with superficial radiation therapy, acute reactions, such as erythema and mild discomfort, can be expected and systemic side effects are rare (23). This study aimed at systematically investigating the safety and effectiveness of superficial radiation therapy technology versus other conventional treatments in the treatment of skin diseases. This systematic literature review was performed based on the preferred reporting items for systematic reviews and meta-analyses (PRISMA) protocol in order to assess the safety and effectiveness of superficial radiation therapy versus other conventional treatments. The following electronic databases were systematically searched until March 31st, 2017: PubMed and Cochrane Library. For identification of additional relevant studies, manual search and checking reference lists of included studies was performed. To find related studies, appropriate keywords were searched (“superficial radiation therapy”, “superficial radiotherapy”, and “superficial X-ray”) as MeSH and free-text in databases. Only studies comparing superficial radiation therapy versus other conventional treatments in the treatment of skin diseases were eligible for inclusion and further consideration. Moreover, studies written in English and concentrating on human samples were considered. There was no time limit in the inclusion criteria. After identiﬁcation of studies from databases, duplicate studies were removed. Then the title and abstract of studies were examined against the inclusion and exclusion criteria. If the assessment of the full text shown studies did not meet the inclusion criteria, it was excluded from further examination. Screening the title and abstract and content analysis was done by 2 independent reviewers. 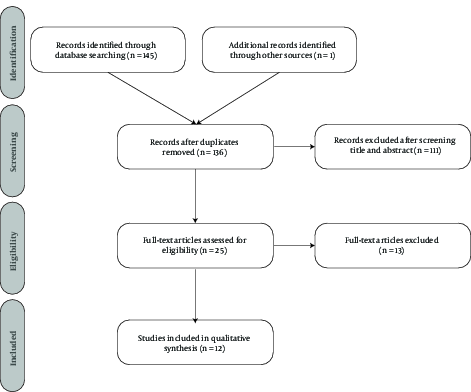 The complete studies selection process was reported using the PRISMA flow chart (Figure 1). The quality of included studies was assessed using the Oxford centre for evidence-based Medicine (OCEBM) levels of evidence criteria (24). Effectiveness outcomes: Efficacy, improvement rate, failure rate, clinical improvement, time of use, recurrence rate, and cosmetic consequences. Safety outcomes: Side effects and the severity of symptoms. In total, 146 studies were retrieved from searching the databases. At the beginning of the review, 10 studies were removed due to duplicates. The title and abstract of the remaining studies (136 studies) were reviewed and 111 studies were removed. The full text of remaining studies (25 studies) were reviewed and based on the inclusion and exclusion criteria, 13 other studies were removed, and ultimately 12 studies were included in this review (Figure 1). In total, 1985 patients were examined in the included studies. The characteristics of the included studies are described in Table 1.
aBased on the checklist Oxford centre for evidence based Medicine (OCEBM) levels of evidence. Based on Oxford centre for evidence-based Medicine (OCEBM) levels of evidence criteria, 4 studies were graded at the 1b level, 3 at 2b level, 3 at 4 level, and 2 at 5 level of evidence (Table 1). Most of the eligible studies (11 out of 12 with 1795 patients) compared the effectiveness outcomes. Comparison of efficacy of superficial radiation therapy in the treatment of hand eczema has better treatment results than the placebo. The advantage of the treatment by superficial radiation therapy had the highest value within 6 to 9 weeks after starting the treatment, yet it remained after 18 weeks. The study showed that patients with hand eczema that did not show improvement with the ointment could benefit from a course of superficial radiation therapy (11). Results of comparing the treatment by traditional superficial radiation therapy versus placebo in patients with eczema showed that superficial radiation therapy is better than placebo for the treatment of hand eczema, yet the efficacy of superficial radiation therapy for feet eczema was slight. Superficial radiation therapy is recommended for the treatment of hand eczema that doesn’t respond to local treatment. Comparing the treatment by superficial radiation therapy with placebo in patients with palmoplantar pustulosis, revealed that superficial radiation therapy had no effect on the treatment of patients with palmoplantar pustulosis. In one study, patients with eczema and palmoplantar pustulosis were treated with traditional superficial radiation therapy and Grenz ray. Results indicated that for the treatment of hand eczema, superficial radiation therapy is better than Grenz ray, yet for the treatment of palmoplantar pustulosis, it did not impact palmoplantar pustulosis (12). Results of a study on the efficacy of superficial radiation therapy in comparison with the placebo on patients with palmoplantar pustulosis showed no improvement in the treated or untreated zones. The results of this trial indicated that the treatment with traditional superficial radiation therapy had a low therapeutic effect or no effect on the treatment of palmoplantar pustulosis. Its risks seems to be more than its small advantage in the treatment of palmoplantar pustulosis (13). Analysis of efficacy of superficial radiation therapy on feet eczema compared to the placebo demonstrates a significant reduction in the mean of eczema grade during 6 weeks of therapy with both methods. This reduction was maintained during 12 weeks of follow-up. Although, the improvement rate in superficial radiation therapy was better than the placebo, this trend was not statistically significant. The superficial radiation therapy seems to have less effect on feet eczema (14). Superficial radiation therapy in the treatment of chronic palmar eczema compared to the placebo, showed better treatment results within one month after starting the therapy, yet this difference was not significant on the 3rd and 6th month. The benefits of superficial radiation therapy in chronic palmar eczema do not result in change of trend of this disease (15). Regarding the viewpoint of patients, traditional superficial radiation therapy is more effective than Grenz ray in the treatment of hand eczema within 3, 6, and 12 weeks after starting the treatment. On the 18th week, there was no significant difference between the 2 methods. The results indicated that superficial radiation therapy in all phases was considerably better. Summary of results showed that traditional superficial radiation therapy is better than Grenz ray in the treatment of hand eczema. Nonetheless, the superiority of traditional superficial radiation therapy shows that this method must be an optional therapy, particularly regarding the employed patients that threaten their inability, or are resistant to other common therapies, and require to return to their workplace soon (16). The mean value of improvement rate in orthovoltage therapeutic units for superficial therapy calibrated in 100 KV was 89%. In return, the superficial radiation therapy units calibrated in 100 KV, this rate was 70.3%. This is due to heavier filtration in the orthovoltage unit. The results indicated that superficial radiation therapy is known as one of the most efficient, simple, safe and easy methods in the treatment of warts (10). In the treatment of non-melanoma skin cancer, the 5-year failure rate of surgery compared to superficial radiation therapy was 96% to 90%. When the other effective factors are taken into consideration (P = 0.01, confidence interval 95%, 1.2 - 4.3), superficial radiation therapy was along with failure rate 2.3 times more than surgery (17). The clinical improvement of superficial radiation therapy of chronic hand eczema was better than photochemotherapy, 6 weeks after the treatment, yet this difference was not observed on the 9th or 18th week. Its effect was at its maximum, 6 to 9 weeks after starting the therapy (18). The superficial radiation therapy in the treatment of hand eczema takes less time in the treatment of hand eczema than photochemotherapy, and results in quicker improvement, as well (18). Results of comparison of recurrence rate in electron therapy and superficial radiation therapy in the treatment of non-melanoma skin cancer showed that altogether the local recurrence was 4.9%. The local recurrence for small tumors after electron therapy and superficial radiation therapy was 2.2% (19). The results of comparison of cosmetic consequences in electron therapy and superficial radiation therapy in the treatment of non-melanoma skin cancer showed that electron therapy has better cosmetic consequences than superficial radiation therapy (19). Comparison of the mean value of cosmetic consequences for the patients with basal cell cancer under therapy with superficial radiation therapy was 2.13; only 3 of these patients obtained a score lower than 2. Mean of this value for the patients under the treatment with brachytherapy was 1.47; none of the patients gained a score of more than 2. This difference was significant (20). About half of the eligible studies (5 out of 12 with 530 patients) compared the safety outcomes. According to a study performed during 1973 on 100 individuals for investigation of the side effects of superficial radiation therapy, the only serious long-term side effect of superficial radiation therapy of skin is skin cancer. Summary of results indicated that superficial radiation therapy as an auxiliary therapy is a safe method for the treatment of benign dermatoses provided that altogether not more than 1200 rad is given fractionated to each zone of the skin during lifetime (9). There were no side effects in traditional superficial radiation therapy compared to Grenz ray in therapy of hand eczema (16). In review of Orthovoltage or superficial radiation therapy on 531 warts, no side effects were reported (10). Comparing the side effects of superficial radiation therapy with placebo in the treatment of hand eczema has not been associated with considerable long-term risk (11). In the treatment of chronic hand eczema, there was no significant difference in the severity of symptoms between superficial radiation therapy and photochemotherapy after 6 weeks, yet superficial radiation therapy resulted in greater improvement in the severity of symptoms within 9 and 18 weeks (18). The present study was performed with the objective of investigating the safety and effectiveness of superficial radiation therapy versus other conventional treatments in the treatment of skin diseases. In this review, effectiveness outcomes (efficacy, improvement rate, failure rate, clinical improvement, time of use, recurrence rate, and cosmetic consequences) and safety outcomes (side effects, and the severity of symptoms) are discussed. To determine the validity of the results of superficial radiation therapy in the treatment of benign or malignant skin lesions over or near the skin surface, additional studies must be done since included studies had been published at least 4 decades ago, and most of them (5 out of 12) were conducted by a group of authors in the same country (The UK) (11-14, 16). Among the remaining studies, only 3 were conducted in other countries (USA, Australia and The Netherlands) (10, 17, 19). Clearly, the technology and our awareness of the disease has changed over the course, thus for definite statement about the results, more recent studies are required. In addition, conflicts of interest have not been stated in any of the studies, although this is relatively common; in any case, if there is a conflict of interest, it can be very influential on the researchers’ reports (25). These issues can also be acknowledged for other indications. Superficial radiation therapy is proposed to accelerate the treatment of hand eczema (16) and to treat those, who have not responded well to local ointments (11). Based on the results, in the treatment of hand eczema, superficial radiation therapy has cautiously better treatment results than Grenz ray and can be used for hand eczema. However, the treatment of eczema in other parts of the body requires more investigation (12, 14). With the consideration of clinical improvement and time of use, superficial radiation therapy is better than photochemotherapy (18). Given the failure rate, surgical treatment is preferred in the treatment of non-melanoma cancer (17). In addition, in this disease, electron beam therapy and superficial radiation therapy also reduces recurrence rate (19). In treating different types of cancer (basal cell carcinoma and non-melanoma cancer), the cosmetic consequences of the patients’ perspective, electron beam therapy, superficial radiation therapy, and brachytherapy, respectively, had the best outcomes (19, 20). During treatment with superficial radiation therapy (compared to photochemotherapy), the severity of symptoms improves (18). In addition, acute complications, such as redness and mild discomfort are observable, yet the systemic side effects rarely occur (6). The results of this study also showed superficial radiation therapy had no side effects on treatment of hand eczema. Side effects reported in other studies are low but serious (9-11). To prevent skin cancer as a side effect, it is necessary to track the dose taken by the patient during their lifetime (9). Manage of this issue will be difficult without real coherence in providing such services. In addition, portability of superficial radiation therapy systems to employ in an office-based setting (6, 21) and providing these services in several stages of treatment of certain diseases (11, 14), make this problem even more difficult. Based on the available evidence, which is not up to date and generalizable, it could be concluded that superficial radiation therapy had no side effect on treatment of hand eczema, and also has better treatment results and can be used for hand eczema, yet for other indications, extra studies need to be performed. Use of this technology along with other methods, may have better consequences for the patients. However, in order to make better decisions in this area, new studies must be carried out in various contexts. However, if superficial radiation therapy is licensed to be used in a country, in order to prevent low but serious side effects, there must be a coherent system with the aim of recording its use for each patient. The lack of quantitative analysis of the results, due to the lack of the same effectiveness criteria in the studies, was the limitation of the study. This study was conducted with the financial support of IR Iran’s national institute of health research, Tehran University of Medical Sciences. Contract No. 241/M/9622. Conflict of Interest: The authors had no conflict of interest in this article. 1. Malmir S, Mowlavi A, Mohammadi S. Evaluation of dose enhancement in radiosensitizer aided tumor: A study on influential factors. Rep Radiother Oncol. 2015;2(4). doi: 10.5812/rro.11076. 2. Grossi Marconi D, da Costa Resende B, Rauber E, de Cassia Soares P, Fernandes J, Mehta N, et al. Head and Neck Non-Melanoma Skin Cancer Treated By Superficial X-Ray Therapy: An Analysis of 1021 Cases. PLoS One. 2016;11(7). e0156544. doi: 10.1371/journal.pone.0156544. [PubMed: 27367229]. 3. Zhang P, Qiao Y, Xia J, Guan J, Ma L, Su M. Enhanced radiation therapy with multilayer microdisks containing radiosensitizing gold nanoparticles. ACS Appl Mater Interfaces. 2015;7(8):4518-24. doi: 10.1021/am506866a. [PubMed: 25679345]. 4. Jones ME, Hardy C, Ridgway J. Keloid Management: A Retrospective Case Review on a New Approach Using Surgical Excision, Platelet-Rich Plasma, and In-office Superficial Photon X-ray Radiation Therapy. Adv Skin Wound Care. 2016;29(7):303-7. doi: 10.1097/01.ASW.0000482993.64811.74. [PubMed: 27300360]. 5. Soyer HP, Rigel D, Wurm EMT. Dermatology. Actinic Keratosis, Basal Cell Carcinoma and Squamous Cell Carcinoma. In: Bolognia JL, Jorizzo JL, Schaffer JV, editors. 3 ed. Edinburgh, Scotland: Elsevier Saunders; 2012. p. 1773-94. 6. McGregor S, Minni J, Herold D. Superficial Radiation Therapy for the Treatment of Nonmelanoma Skin Cancers. J Clin Aesthet Dermatol. 2015;8(12):12-4. [PubMed: 26705443]. 7. Rowell N. Adverse effects of superficial X-ray therapy and recommendations for safe use in benign dermatoses. J Dermatol Surg Oncol. 1978;4(8):630-4. doi: 10.1111/j.1524-4725.1978.tb00514.x. [PubMed: 690314]. 8. Johnstone CD, LaFontaine R, Poirier Y, Tambasco M. Modeling a superficial radiotherapy X-ray source for relative dose calculations. J Appl Clin Med Phys. 2015;16(3):5162. doi: 10.1120/jacmp.v16i3.5162. [PubMed: 26103479]. 9. Rowell NR. A follow-up study of superficial radiotherapy for benign dermatoses: recommendations for the use of X-rays in dermatology. Br J Dermatol. 1973;88(6):583-90. doi: 10.1111/j.1365-2133.1973.tb08023.x. [PubMed: 4717414]. 10. Macht SH, Cordero JM. Superficial radiotherapy of warts: results of treating 531 warts. Radiology. 1977;122(1):231-2. doi: 10.1148/122.1.231. [PubMed: 830341]. 11. Fairris GM, Mack DP, Rowell NR. Superficial X-ray therapy in the treatment of constitutional eczema of the hands. Br J Dermatol. 1984;111(4):445-9. doi: 10.1111/j.1365-2133.1984.tb06607.x. [PubMed: 6386031]. 12. Fairris GM, Jones DH, Mack DP, Rowell NR. Superficial radiotherapy for benign localized dermatoses. Br J Dermatol. 1984;111(Suppl 26):19. doi: 10.1111/j.1365-2133.1984.tb05236.x. 13. Fairris GM, Jones DH, Mack DP, Rowell NR. Superficial X-ray therapy in the treatment of palmoplantar pustulosis. Br J Dermatol. 1984;111(4):499-500. doi: 10.1111/j.1365-2133.1984.tb06607.x. [PubMed: 6386034]. 14. Fairris GM, Jones DH, Mack DP, Rowell NR. Superficial X-ray therapy in the treatment of constitutional eczema of the feet. Br J Dermatol. 1984;111(4):500-2. doi: 10.1111/j.1365-2133.1984.tb06607.x. [PubMed: 6386035]. 15. King CM, Chalmers RJ. A double-blind study of superficial radiotherapy in chronic palmar eczema. Br J Dermatol. 1984;111(4):451-4. doi: 10.1111/j.1365-2133.1984.tb06608.x. [PubMed: 6386032]. 16. Fairris GM, Jones DH, Mack DP, Rowell NR. Conventional superficial X-ray versus Grenz ray therapy in the treatment of constitutional eczema of the hands. Br J Dermatol. 1985;112(3):339-41. doi: 10.1111/j.1365-2133.1985.tb04862.x. [PubMed: 3884032]. 17. Ashby MA, Smith J, Ainslie J, McEwan L. Treatment of nonmelanoma skin cancer at a large Australian center. Cancer. 1989;63(9):1863-71. [PubMed: 2702595]. 18. Sheehan-Dare RA, Goodfield MJ, Rowell NR. Topical psoralen photochemotherapy (PUVA) and superficial radiotherapy in the treatment of chronic hand eczema. Br J Dermatol. 1989;121(1):65-9. doi: 10.1111/j.1365-2133.1989.tb01401.x. [PubMed: 2757957]. 19. Griep C, Davelaar J, Scholten AN, Chin A, Leer JW. Electron beam therapy is not inferior to superficial x-ray therapy in the treatment of skin carcinoma. Int J Radiat Oncol Biol Phys. 1995;32(5):1347-50. doi: 10.1016/0360-3016(94)00603-I. [PubMed: 7635774]. 20. Berridge JK, Morgan DA. A comparison of late cosmetic results following two different radiotherapy techniques for treating basal cell carcinoma. Clin Oncol (R Coll Radiol). 1997;9(6):400-2. doi: 10.1016/S0936-6555(97)80137-9. [PubMed: 9448970]. 21. Maghsudi M, Mohamadi S. A study on the relationship between job burnout and couple burnout of female g ynecologists (case study: Tehran). Women Dev Polit. 2010;8(3):57-71. Persian. 22. Veness M, Richards S. Dermatology. Radiotherapy. 2. Basel, Switzerland; 2012. p. 2291-301. 23. David CV. Electronic brachytherapy and superficial radiation therapy: will you be adding it to your practice? Cutis. 2013;92(5):E16-8. [PubMed: 24343219]. 24. Phillips B, Ball C, Badenoch D, Straus S, Haynes B, Dawes M. Oxford centre for evidence-based medicine levels of evidence (May 2001). BJU Int. 2011;107(5):870. doi: 10.1111/j.1464-410X.2011.10141.x. [PubMed: 28640539]. 25. Cherla DV, Olavarria OA, Bernardi K, Viso CP, Moses ML, Holihan JL, et al. Investigation of Financial Conflict of Interest among Published Ventral Hernia Research. J Am Coll Surg. 2018;226(3):230-4. doi: 10.1016/j.jamcollsurg.2017.12.009. [PubMed: 29274839].